Today has been a beautiful day. It has been much warmer. My step-son came over to visit this morning with his four-year-old daughter. Most importantly, my relationship with my husband is going extremely well. I also figured out my Cronometer log for the rest of the day, and it is all but perfect. To balance my potassium and sodium, I have been using V8 and V8 low sodium. V8 alone is too high in sodium. V8 low sodium is too high in potassium, and it does not taste that great. Combine the two and power! I can balance my potassium/sodium ratio to whatever I want. And it tastes great! Using V8 also reduces my dependence on km Mineral Supplement, which is great but rather expensive. Let me see if I remember those twelve activities that increase happiness from The How of Happiness. Avoiding Over-thinking and Social Comparison. Good. I still have them in mind. If I reviewed them every day, would that make me happier? Let me start with gratitude. 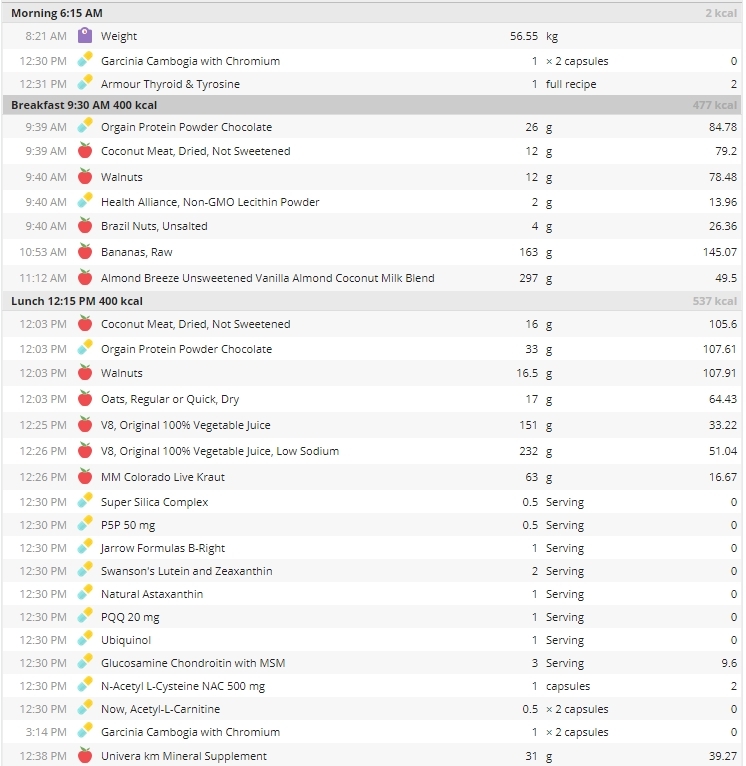 Here is my Cronometer diet diary for yesterday. The calories are a bit over-budget, but still less than I probably burned. Notice that I got 100% of my targets. That is an achievement and is getting easier with practice. I was a bit hungry last night before bedtime. However, after doing so well with this diet diary, I was motivated not to eat, so I did not. That edge of motivation is one good reason to use a diet diary. Otherwise, I probably would have eaten, and I would have blown my diet, possibly leading to weight gain. Notice that I ate less than 55 grams of sugar. Actually, I ate 43.6 grams of sugars. 55 grams or less is a goal I have set for myself that I have seldom achieved lately. Now it is time to start aiming at that target again because it does make a difference. I have aimed at less than 25 grams of sugar before, but I think if I can eat less than 55, I am doing well. Notice that I used a few supplements. 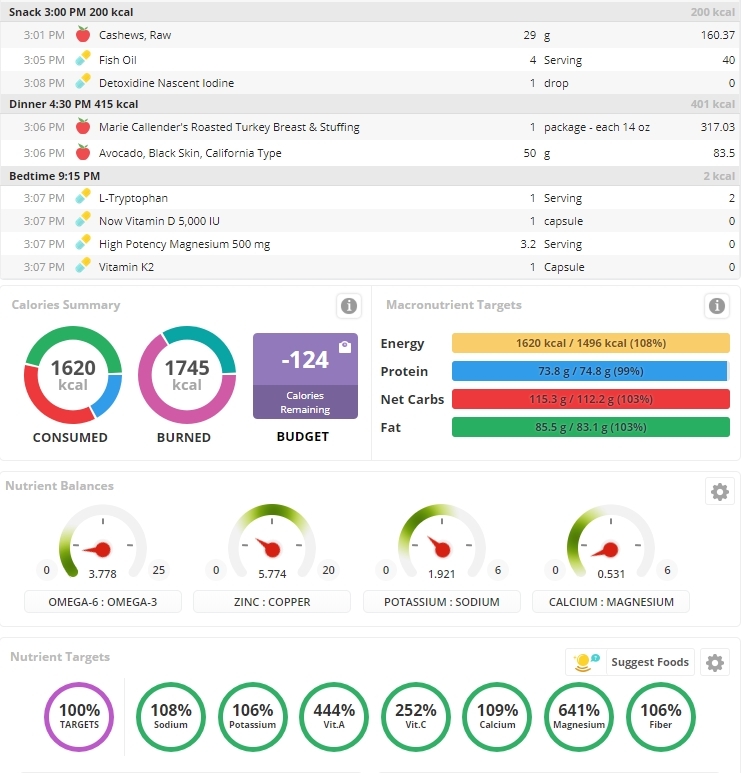 It is probably impossible to get 100% of my targets and stay in my calorie budget without the use of supplements. However, it is advantageous to do the best I can with food. Yesterday, I got more than 30 grams of fiber without using a fiber supplement, so I feel good about that. Notice that I used quite a few nuts yesterday. Because nuts contain a lot of copper, that made my zinc/copper ratio a little low. I could increase that ratio by using a whole silica complex rather than half, as that supplement contains quite a lot of zinc. Nuts offer a lot of advantages in dieting. I am glad I used them for my afternoon snack. My afternoon snack can get out of control, and I did okay yesterday because I ate cashews. You may recall that when I took nuts with me to the rehab center last fall, I was able to control my weight and appetite better than I could without them. Notice that my potassium/sodium ratio is great. 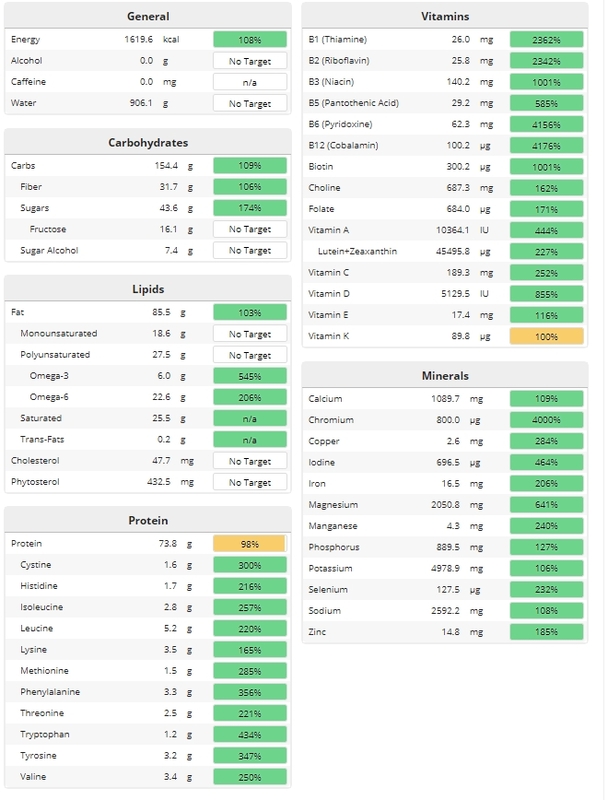 I ate quite a few high potassium foods, and got more than 4700 mg for the day, which is quite an achievement. I was careful not to overdo my sodium intake. Balancing the two kinds of V8 was a good move. I still took some km Mineral Supplement for potassium, but I needed less than I have typically been taking. Yesterday was not absolute perfection but very close to it. With Cronometer, I just do the best I can. With so many competing goals, I have to balance out everything as much as possible. In the heat of my appetite, that can be a challenge. However, using Cronometer is fun–like a game. No two days are alike.